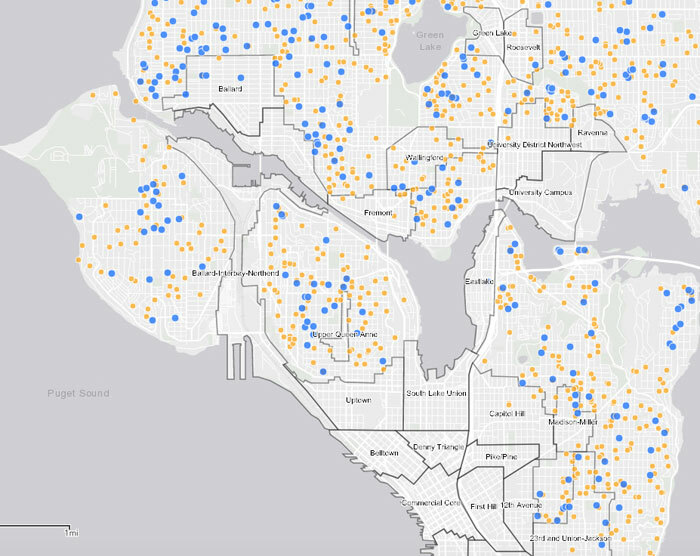 The City of Seattle has an online map showing where attached and detached accessory dwelling units are located, which are marked in yellow and blue, respectively. 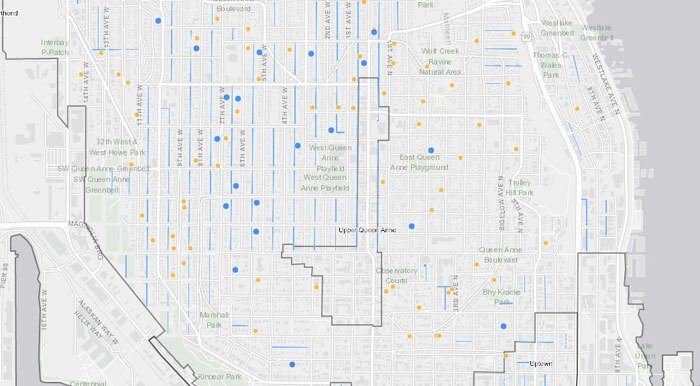 There are no mother-in-laws or backyard cottages in the Upper Queen Anne Urban Village. The Queen Anne Community Council has filed an appeal with the Seattle Hearing Examiner, challenging the City of Seattle’s final environmental impact statement for a package of code changes that would make it less prohibitive to build accessory dwelling units. Architect Marty Kaplan filed the appeal on behalf of the Queen Anne Community Council, challenging the legal adequacy of the FEIS, which was published on Oct. 4. All alternatives considered in the final environmental impact statement — other than taking no action — would increase the production of ADUs citywide. Under the preferred alternative, lots in single-family zones can have an AADU and DADU (in lots with a minimum of 3,200 square feet), or two AADUs, and would not require off-street parking or that the owner live in any of the dwelling units. One year of continuous ownership would be required to build a second accessory dwelling unit. The Magnolia Community Council voted at its Sept. 18 meeting to support QACC’s appeal plans, and plans to discuss the ADU FEIS during its land use committee meeting 2:15-3:45 p.m. Saturday, Oct. 20, at the Magnolia Library, 2801 34th Ave. W.
The preferred alternative “could result in minor impacts from increases in building density and population density,” according to the FEIS, but also includes a floor-area ratio that would reduce aesthetic impacts. While the preferred alternative could result in 3,690 new ADU residents, the FEIS states, the city does not anticipate service impacts for its various departments, such as police, fire and utilities.